Houses & Homes VA: Is it OK to paint the siding on my home? Is it OK to paint the siding on my home? One of the reasons that we like siding on our homes is the fact that we don’t need to paint it. This has been its main selling point since it was first introduced but even high quality siding can lose that shiny “like new” luster after some years. With this in mind sometimes a change can be good and sometimes people wonder if it’s OK to paint the siding on their home. First of all it is OK to paint over vinyl or even aluminum siding. Keep in mind that if you decide to do this it won’t be only a one time job. Painting siding is the same as painting anything else in your home and the paint will peel and fade in time the same as any other part of your home. This means that once you do it you will need to maintain it the same as any other painted surface. There was a time that white was the only color available in siding but today there are many other choices available and the only reason to paint it a different color is to save money. If you want a different look (and many of us do!) than you might consider a visit to your friendly neighborhood siding man. 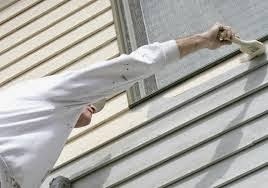 You could save yourself a lot of work in the long haul and new siding is a great improvement to any home. If finances are an issue than painting with a high quality exterior paint is your next best option. Take it from me, cheap paint is never worth the investment. Unlike many other types of surfaces vinyl siding is difficult to paint because siding is designed to allow the water to run off when it rains, in other words it is slippery. Water based paints won’t stick very well to vinyl siding and is very difficult to paint. Your best bet is to use vinyl paint that is made with acrylic and urethane resins. This will actually adhere much better to the siding and make painting a much simpler task. It will also last for a long time. Keep in mind that you may need to use several coats if the new color is different than the original color and plan accordingly when purchasing the paint. Latex paint is fine for wood siding and even aluminum but it is water based and not a good fit to paint vinyl. Have you heard of thermal expansion? Simply stated it means that as the temperature rises your siding will actually expand. This is why you might have a door in your home that will “stick” on very hot days. For this reason you cannot paint in direct sunlight. If you do there’s a good chance that as the paint dries it will crack and split and the end result will be a nightmare. Plan ahead so that you are painting in the evening or at least when that part of your home is covered in shadow. Beware of dark colors. The darker the paint color the more heat it will absorb. This can be a big problem if you are painting lighter colored siding because it could actually cause warping as a result of our old friend thermal expansion. Choosing a different lighter color is a much safer choice if the original siding is white or any other light color.